A post operative compression garment can assist in the body’s healing process and even improve the healing and procedure results by providing accurate compression and pressure to the area of the body where the liposuction or surgery was performed. A post operative garment is designed and constructed with a specific purpose: to encourage the healing and recovery process after a reconstructive or aesthetic procedure, and help the skin conform to its new contours. During a liposuction fat is removed, affecting the cohesion of the dermal, fat, and muscle layers under the skin. In addition, trauma to blood vessels and capillaries, the lymphatic system, and connective tissues can occur. Postsurgical compression and pressure of a surgical site is desirable to minimize swelling and stretching of tissue due to fluid accumulating in the surgical region, especially where fatty tissues have been removed via liposuction. Design Veronique has been designing and manufacturing compression garments for over 20 years, they are a market leading company based in the USA with an extensive collection of compression garments. Their experience, product range and product quality make Design Veronique the best choice for post liposuction and body contouring garments. 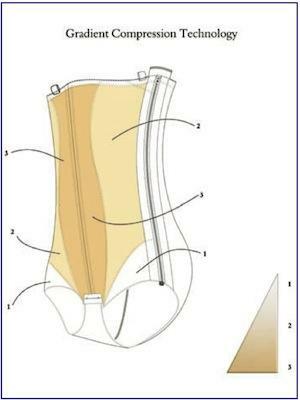 The Design Veronique product range features numerous pressure garments that provide compression and support for abdominal, hip and thigh area- these are the most common areas addressed in aesthetic surgery. There are both zippered and non-zippered garments, the zippered garments are worn immediately after the procedure while non-zippered garments are worn for extended body contouring. The product line has the ideal garment style you need for your entire recovery. How Long Should I Wear A Post Operative Compression Garment? Yes, it sounds a bit strange- a liposuction compression garment with an open crotch. Is an open crotch really necessary? Why? Is it comfortable? What does a Post Operative Compression Garment Do?